If you’ve visited a shop in downtown Benson recently or were inside someone’s home in the area, you may have noticed a curious smell — sweet, tangy, salty, refreshing, warm, inviting. Follow your nose and it will most likely lead you to Benson’s own C.A. Homestead and their popular line of candles. C.A. Homestead is Angel Sanchez and Chris Davis, two crafty fellows that decided to use their downtime to start a business in 2013. 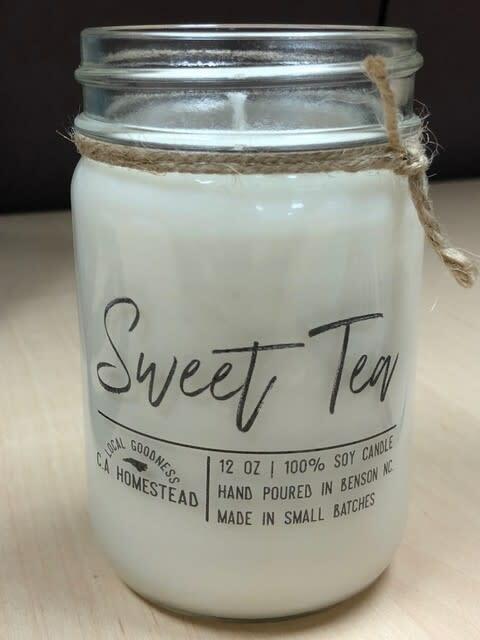 There had to be a better way to make a candle, he continued, and as it turns out, there is — soy. After establishing a line of scents, the two set up at their first craft fair — Mule Days. “I think we took three cases and we thought that was too much,” said Mr. Davis with a chuckle. It turned out not to be enough. From that first Mule Days, C.A. Homestead candles saw something of a whirlwind in popularity, eventually leading to the attention of Our State Magazine, which featured the brand on its website store in 2015, and being featured on Time Warner Cable’s “Made in the Carolinas” segment on television shortly after. Mr. Sanchez and Mr. Davis said that recognition really helped to drive sales. Today, C.A. Homestead is selling a brand new line of candles. There is also a smaller 9oz “tumbler” line. 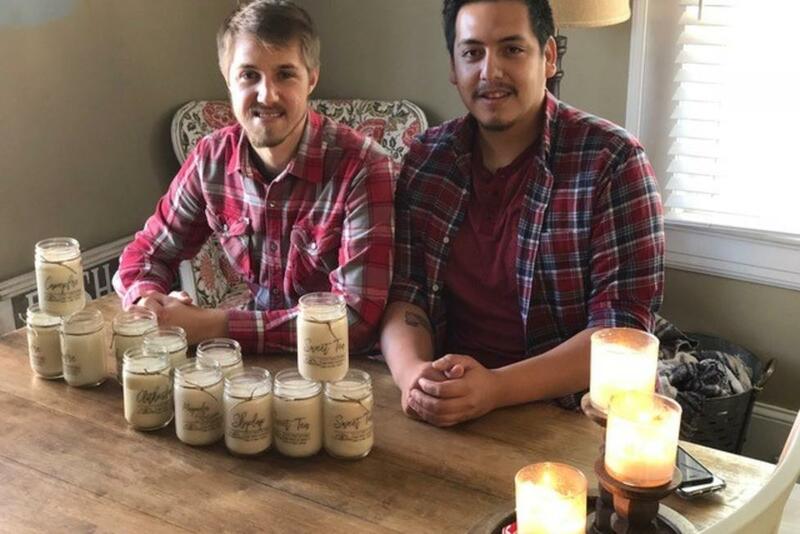 With the success of their candle line, Mr. Sanchez and Mr. Davis are looking forward to expanding their C.A. Homestead brand to include kitchen items and home decor. “We’re in the process of branching out. Before, all we did was make candles. Now, it has built itself into a whole brand,” said Mr. Sanchez. “We wanted to combine what both of us were interested in. I love to cook so we have been uploading cooking videos to our C.A. Homestead Youtube channel. We try to get one recipe up there a week,” added Mr. Davis. “Plus, a lot of our friends that we met making candles, their brands are what we’re going to bring in. We have a friend that makes a spicy relish for instance — all products that we use and love as well,” continued Mr. Sanchez. C.A. Homestead candles, as well as other products, are available through their official website — www.shopcahomestead.com. Candles can also be purchased at Rebecca’s Vintage Market in downtown Benson, Uwharrie Mercantile in Troy, Grounds Cafe in Wendell, and Sweet Tea & Cornbread in the Crabtree Valley Mall in Raleigh.